Extend your ATS International Conference experience. Get one year of free complimentary access* to more than 200 hours of select ATS 2016 scientific symposia webcasts in the Best of ATS Conference collection. Paid full conference registrants will receive 12 months of free access to on-demand online viewing of webcasts. These offerings reflect a range of topic areas, including major symposia in clinical, basic, translational, and behavioral science, and all Year in Review sessions. No additional registration or order is required for full conference registrants to receive this benefit. After ATS 2016, access to the webcasts will be available on the ATS Store website at store.thoracic.org, and login credentials will be emailed to participants shortly after the conference. Visit the Best of ATS Education Products booth, located in the Moscone Center, Lobby (South Building, Upper Level), to see the list of select scientific symposia included in the Best of ATS Conference collection. The ATS Store is open from 8 a.m. to 4:30 p.m. through Wednesday. 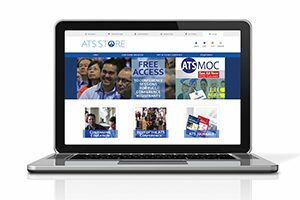 While at the ATS Store, ATS members may take advantage of a 20 percent discount on all on-site purchases, including on-demand webcasts, audio (MP3s), and flash drives of the 2016 postgraduate course syllabuses. Also, peruse the growing selection of Maintenance of Certification products available to assist in earning American Board of Internal Medicine MOC Medical Knowledge Points and American Board of Pediatrics Part 2 Self-Assessment Credits. * Free access is limited to paid conference registrants in the following registration categories: full members, affiliate members, in-training members, senior/emeritus members, nonmembers, and in-training nonmembers who are registered for the full conference.